Wheelabrator facilities operate with superior environmental performance and are extensively regulated pursuant to state and federal air, water and solid waste laws and regulations to protect human health and the environment. All of our facilities have maintained their environmental permits without exception, since commencing operations over 40 years ago and we continue to perform, on average, four to five times better than standards set by the U.S. Environmental Protection Agency. 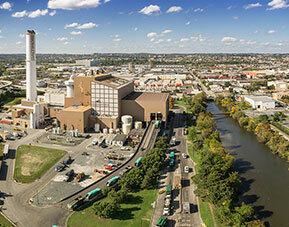 First waste-to-energy plant in U.S. In 1975, Wheelabrator introduced the first large-scale, commercially successful facility in the U.S. when we opened Saugus north of Boston. First to install advanced air pollution control technology. Wheelabrator Millbury was among the first waste-to-energy facilities in the U.S. to install advanced air pollution control technology designed to control SO2 and other acid gas under EPA and state best available control technology requirements. First to install carbon injection systems. Wheelabrator Falls was the first waste-to-energy facility to install a full-scale powder-activated carbon injection system in the U.S. to improve mercury emission control.